Nurunnahar Monzu is a woman leader from Kewra, a village in the Jhalakathi district of Barisal region of Bangladesh. She was born and grew up in an extremely poor family. Her father, a farmer, was the sole earner in their family. Her family faced such serious financial constraints that they were not able to send her to school. They arranged Nurunnahar to marry a young man in their village. Her husband struggled to find employment and could not put food on the table for their family. Nurunnahar’s husband then divorced her in a demand for dowry. Facing this challenging situation, MDG Union Coordinator Zakir Hossain advised Nurunnahar to get involved with The Hunger Project as a women leader of the Bikoshito Nari Network (BNN, Unleashed Women’s Network). 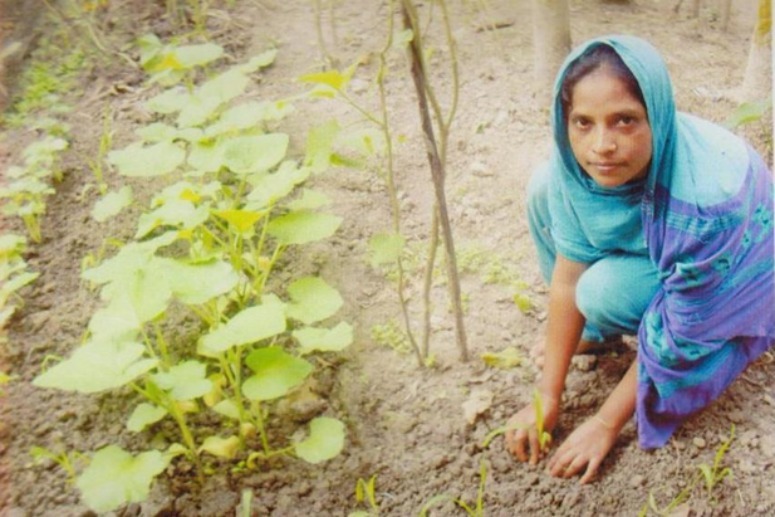 After attending the women’s leadership foundation training session with The Hunger Project-Bangladesh, Nurunnahar learned skills about homestead gardening and started her own ‎family garden. The garden now not only feeds Nurunnahar’s family and saves her money, but she has even been able to begin selling her excess produce to make a profit. Nurunnahar has also created a women’s savings organization to ‎empower the ‎women of her community. Since becoming involved with The Hunger Project-Bangladesh in her village, Nurunnahar has a regular income and her family no longer struggles to find food. Her only daughter is growing up with adequate food, health care and in a good environment with access to education, and a mother who supports her attendance of school. Nurunnahar is an active member of the Ward Action Team in her community and a member of additional decision making committees in within her Union. She has shared her various income-generating initiatives with neighbors within her community, and has spoken about how the income-generating activities launched have given her a sense of “economic empowerment” and overall “progress.” Nowadays, Nurunnahar works throughout her union to raise awareness on early marriage prevention and hygiene education. Invest now in women leaders like Nurunnahar.